I Chronicles 12:32 seems to extol the legacy of those who “understood the times and knew what God’s people should do.” I say often that our bookstore exists, in part, to create sons and daughter of Issachar. Reading widely is a God-given obligation for those who want to understand the times; we cannot develop a faithful perspective only by reading the Bible and attending worship; we must read the times, study the world, endeavor to understand more. In these cooler days here on the East coast I’ve been trying to sit outside…morning, day or late night, reading books I’ve been wanting to get through this summer. I read different sorts of things, as I’m sure you do, and I will tell you more in a few days. Here are a few that hopefully could make you wiser as you learn to more deeply discern the twilight of Western civilization and the shifting epoch we finding ourselves in. Here are a few I’ve worked with lately. Why You Think the Way You Do: The Story of Western Worldviews from Rome to Home Glenn Sunshine (Zondervan) $14.99 I know, I know, you most likely don’t want to read a history of the Western world. Not even a survey that is called “accessible and eminently readable.” A few readers, though, may need to know about this. This seems a very nice approach, showing the flow of ideas as a continuous narrative rather than a simple catalog of ideas. It traces the effects changes in worldview had on society. Sunshine wrote the great little primer The Reformation for Armchair Theologians and I commend him as a clear and insightful guide. Can Christian thinking and the subsequent lifestyle of alternative practices and ways of being truly transform the culture, the way Christian faith once did? If we live out the full implications of the gospel, we surely can hope so. This new, interesting overview of our culture’s history could help. I’ve happily, but slowly, tackled a few chapters of the really interesting work by the very learned Jay Parini called Promised Land: Thirteen Books That Changed America (Doubleday; $24.95.) Now this is a fabulous way to learn about American history, the shift in ideas, the significance of books and letters, and how we ended up where we are today. It starts with a splendid account of the mythic and valuable Of Plymouth Plantation and then The Federalist Papers and ends up with a description of the impact of On The Road and The Feminine Mystique. (With a good 9 other titles in between.) Learning about American history, intellectual history, and social trends never ceases to interest me, and I think those interested in how the church must speak into our times would do well to learn from these kinds of surveys of historical development. Books and writers alone have not shaped our world, but we would be ignorant to dismiss the significant way these authors have impacted us. As a bookseller, I was proud, reading some of this…of course, Uncle Tom’s Cabin is in here, as is Walden and a fascinating description of the impact of Huck Finn. The chapter on How to Win Friends and Influence People is very important, as it shows the ways in which we’ve shifted to a self-help ethos. Speaking of influential books, there is a new translation of Fyodor Dostoevsky’s little Notes From the Underground (Eerdmans; $15.00) that I has been long in coming, re-translated by the most eminent of Russian translators. John Wilson of Books & Culture tells of reading this book in high school (of course he did) and ever since seeing his description of how it impacted him, I wanted to get a newer translation. Kudos to Eerdmans for releasing it. Notes…, obviously, is an older book–published first in 1864— that has shifted our thinking, prefigured existentialism and even what we now may call postmodernism. It helps us, they say, understand Dostoevsky’s fiction, too, as he unflinchingly examines the dark, mysterious depths of the human heart. Speaking of heady stuff that helps us get at our place in history, I have started the latest two in the series edited by philosopher James K.A. Smith in the series called “The Church and Postmodern Culture.” They are fairly slim but serious, attempting to bridge the most serious philosophical stuff and the life of Christian thinkers in the churches. Merold Westphal is a Mennonite scholar that anyone who has followed discussions of postmodern thinking most likely has heard of and here is a very great example of his concise prose and passion for aiding churches walk into these heavy topics. And it is heavy stuff. His brand new book in this series is called Whose Community? Which Interpretation? Philosophical Hermeneutics for the Church (Baker Academic; 19.99.) Jens Zimmerman of Trinity Western University calls it “beautiful.” Bruce Ellis Benson, the chair of the philosophy department at Wheaton says that Westphal “deftly navigates between hermeneutical despair and arrogance to arrive at a hermeneutic that affirms the vital importance of interpretation and yet insists that Scripture itself truly speaks.” If this doesn’t turn you on, I understand. But it is one of the critical issues of our times: who does get to interpret the Bible, or anything, for that matter? The first book in this series is very good, written by the editor of the whole set, James K.A. Smith, and is called, Whose Afraid of Postmodernism: Taking Derrida, Lyotard, and Foucalt to Church ($17.99.) As we’ve explained here before, they were lectures Dr. Smith (of Calvin College) gave at L’brai in Switzerland, with some application to the philosophical world, but more for those interested in the kinds of questions being raised by the emergent church conversations. Another recent one in the series is called Globo-Christ: The Great Commission Takes a Postmodern Turn by Carl Raschke ($17.99.) Despite the corny title, it is a very, very important and vibrant work. individuals and Reason isn’t the way God’s world, and our way in it, really works. Hence, the study of hermeneutics, the process of interpretation, and the need to humbly admit that while God’s speaks to us “truth” we always “see through a glass dimly.” To reject rationalism does not demand that we embrace relativism, though. Our era is the time these two historic worldviews are colliding. The latest in this series is a heavy one by British philosopher Graham Ward and it, too, struggles with the postmodern questions, once we realize we are in somewhat fluid ground, and live in a real world where, in deed, the facts aren’t so evident, and the church & world often collide. Ward knows his cultural theory, and he is an orthodox theologian and his is very prolific. This new one is called The Politics of Discipleship: Becoming Post-Material Citizens (Baker; $19.99.) I find the sub-title off putting, but I want to know why Jamie thinks this is so worthy, so I’ll dip into it a bit. Smith calls it a “thick” description, almost like ethnography. John Milbank raves, calling it “extremely significant” as does Stanley Hauerwas, who exclaims “Extraordinary!” This is not old-school liberal social gospel stuff, and it is not, obviously, anything like the religious right. Hmmm. In a post-everything world, this may be what discipleship demands. 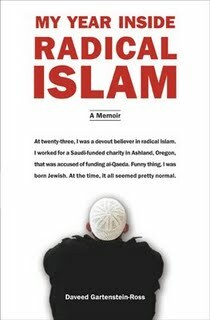 My Year in Radical Islam: A Memoir Daveed Gartenstein-Ross (Tarcher) $14.95 How does a kid born Jewish go off to college, end up becoming a Sufi, and then shift to being a radical Islamist, working for a Saudi-funded charity that was accused of funding al-Qaeda? How does one become a true believer, even with hippy-dippy new age parents and evangelical Christian friends and a girl friend who is not a Muslim? Give up music? Pray for the mujahideen? Grow the beard? Start allowing the possibilities that friends with multiple wives and violent ideologies could be right? This is a book I could not put down, literally zipped through in one long Sunday, and have been haunted by it ever since. I don’t want to say to much, but it is an eye-opening memoir of the journey into fundamentalism, and one learns a bit about Islam along the way. As the L.A. Times put it, this author has “something rare to offer, namely the perspective of someone who has ties with each of the major monotheistic faiths.” That is putting it mildly. Fascinating. I do think it would have been helpful if he would have explored his own psychological state a bit more; more, his spiritual state. That is, his slow embrace, and then shift away from this odd subculture seems to be such a radical thing, he might have told us more about his deepest convictions and the feelings of his heart in these times. Some seemed nearly matter-of-fact, which, perhaps it was. I wanted a bit more, in part because I cared about the characters and their stories. I really did enjoy this troubling, but very earnest telling, and certainly the rise of radical Islam is a reaction to the decadence of the modernized, secularized West. Those who think that the terrorists are mostly concerned about social injustice or poverty simply aren’t paying attention. Bin Laden and the boys are against the West because of our commitments to science, freedom, hedonism, crass materialism, individualism, secularity, pluralism…Che Guevera or the mid-80s Sandinistas, perhaps, claimed to care about justice for the poor, but the American left, it seems to me, is misguided in thinking of Islamic terrorists in those categories, as if they attack us over Cold War stuff. The folks that Gartenstein-Ross came to belong with were radical Muslims who wanted Salifism, a sharia theonomy under Quranic rule, and are deeply religious. This conflict, obviously, is a major aspect of our times, and we would be well to know more about it. 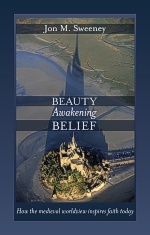 Beauty Awakening Belief: How the Medieval Worldview Inspires Faith Today Jon M. Sweeney (Morehouse Publishing) $20.00 Sweeney is a good writer and memoirst himself (he is an editor at the lovely Paraclete Press.) Here, he walks us through two major, historic cathedrals in Europe, showing how the symbolism of the archetecture showed forth a way of seeing life that, actually, could be a profound asset for those seeking a third way out of the secularism of modernity and the weirdness of postmodernism. Here, in high medieval vision, we see the integration of heaven and Earth, space and sanctuary, stone and light…a lovely and awe-inspiring work that helps us learn about the past, about the arts, and about a God-centered way of thinking. From the deeper meaning of gargoyles to flying buttresses, from darkness to flight, this look at medieval architects and masons has much to commend to us today. Wow-o-wow, this is a fun and clever book, with photos and cartoons and etchings on nearly every other page, and every chapter in a different type font. It is interesting and new and deep and exciting. And all those doodads and pictures! Of course it would have to be so decorated since the book is about our shift towards images in this postmodern culture, the need to engage the world of pictures, images, art. Godawa tells in the first chapter about being a tough-minded evangelical interested in rationalist proofs for the existence of God and arguments that could prove the validity of the Bible. From his deep knowledge of all the sources listed in resources like Josh McDowell’s Evidence That Demands a Verdict and such, he could attack anybody willing to intellectually spar, and usually win the battle of the mind. (And, from the fascinating footnotes in this easy to read book, it is very evident that he was, and remains, one very sharp cookie.) And yet, was this really proper Christian apologetics? Why the sole reliance or logic, reason and proposition, to the exclusion of metaphor, symbol, visuals, mystery? Was he actually dehumanizing others, and himself, by not being wholistic, dealing with mind and heart? 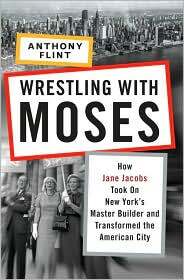 Wrestling With Moses: How Jane Jacobs Took on New York’s Master Builder and Transformed the American City Anthony Flint (Random House) $27.00 Most educated people at least have heard of the legendary Jane Jacobs and her book The Death and Life of the Great American City (Vintage; $15.95.) She is known as the most important writer about humane city planning and could be considered the great-grandmother of what we now know as “new urbanism.” From the feisty writings of James Howard Kuenstler to the calm theological take of Eric Jacobsen’s Sidewalks in the Kingdom (Brazos; $20) the call to support sane and gracious cityscapes and resistance to gross suburban sprawl has been shaped by Jane Jacobs who protested intrusive, devastating planning in New York city in the early to mid- 1960s. Few know the name of Robert Moses whose large-scale efforts for so-called urban renewal brought powerful forces to bear against local folk. As it says on the flyleaf, “Time and again, Jacobs marshaled popular support and political power against Moses, whether to block traffic through her beloved Washington Square Park or to prevent the construction of the Lower Manhattan Expressway, a ten-lane elevated superhighway that would have destroyed centuries-old streetscapes and displaced thousands of families and businesses.” And she did all this with her young children in tow. “Notorious for exacting enormous human costs, Moses’s plans had never before been halted—not by governors, mayors, or FDR himself, and certainly not by a housewife from Scranton.” Sure this is a book about the cobblestone streets of Greenwich Village, when Bob Dylan was around, and the time’s they were a-changin. But besides the inspiring account of the bohemia of the 60s, it is a story of two visions of American life, a struggle that pitted local folk against Big government and Big business–that pitted scientific reductionism against charm and grace and small scale dignity, and in many ways pointed to the very struggles that seem to swirl around all of the books mentioned above. Whose interpretation, indeed? ‘My Year in Radical Islam’ sounds really interesting. Glad to see that the newest in the Church and Pomo series books are out. They were originally announced as coming out on Sept 1st, but then it seemed like they were being pushed back. This was according to Amazon, which might have something to do with why it’s wrong. Money is a little tight right now, but I’ll definitely be putting some aside to buy one of these from you at Jubilee. Smith’s was good, Caputo’s solid if a little meandering, and Raschke’s is the most interesting and creative in the series, in my opinion. I’m really biased, but I think Westphal’s will prove to be the best of the five. The one that Bruce Benson is working on sounds incredibly interesting, though. I forgot to say that I’m pretty sure Westphal would self-identify as a Reformed scholar, but I’m not sure it matters a whole lot, because based on his scholarly output alone, he has a number of influences. I have to also mention his book “Suspicion and Faith.” If you’ve never had a chance to read it, Byron (or any other blog readers), I can’t recommend it highly enough. It’s easily among the best books I’ve ever read. Thanks for the reminder of Suspicion & Faith. We’ve got that, along with Merald’s others…he has some early stuff on Kierkegaard, too. Glad you are keeping up….it means a lot to know students like you are reading the blog. Glad for your input.